Can The Tea Party Be Controlled? Jonathan Bernstein touches on an interesting question below: Who, exactly, speaks for the Tea Party movement? Many Tea Partiers would say that no one does. It's a grassroots movement, decentralized, self-organizing, bottom-up—all that jazz. Apart from Sarah Palin and Glenn Beck, it doesn't really have any leaders. And yet, there are plenty of groups that would love to channel the Tea Parties' energy (and rage, let's not forget rage) for their own purposes. On top of that, the Tea Party movement may need a bit of centralization and coordination to survive and prosper in the future. But all those competing priorities can create an awful lot of tension. Case in point: Earlier today, Mark Meckler and Jenny Beth Martin of the Tea Party Patriots were at the National Press Club to announce that their organization had just received a $1 million donation from an anonymous funder (David Koch, maybe? Who knows?). That's hardly pocket change. But Meckler was careful with his words. He himself wasn't going to direct where the money was going. After all, he was only a national coordinator—not, he stressed, the chairman or leader of the TPP. The Tea Party Patriot's local affiliates, about 2,800 all told, could apply for the money, use it as they see fit, and the only restriction was that they couldn't endorse candidates. In a lot of ways, there's an interesting parallel here to the Students for a Democratic Society in the 1960s. In the early years, the SDS didn't have a strong central bureaucracy (although there was plenty of infighting). Eventually, attempts to centralize the movement caused the whole thing to implode, particularly at the Chicago convention in 1969. It's not hard to imagine similar dangers lurking for the Tea Party movement, and that seems to be a fate that Meckler and Martin are keen to avoid. 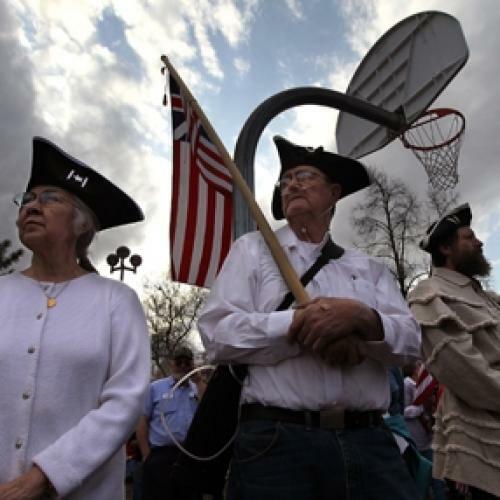 Read here for Jonathan Bernstein's take on whether the Tea Parties make up an amorphous blob or a well-disciplined army--and whether they really matter at all.